The British Medical Journal today published an article describing the newly identified condition known as "publicist’s balls". The news comes after the revelation that the medical condition called "cello scrotum" is in fact a hoax dating back to the 1970s. "There are millions of sufferers of "publicist’s balls" in the UK, and the complaint is growing," explained Professor J. Scott Billingsworth, a maverick behavioural scientist currently serving 6 months in Broadmore. "The condition is spread mainly from marketing departments and is often carried in product advertisements masquerading as the publication of survey results." 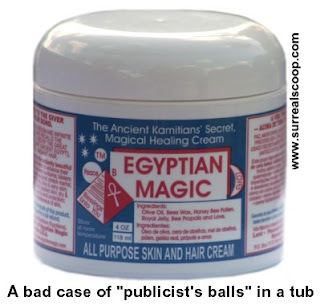 Medical professionals say that some of the worst cases of the condition are in the beauty industry in which there is normally a fresh outbreak of "publicist’s balls" every week. "It seems that the condition breeds rapidly within the warm, moist and unchallenging environment of women’s magazines," said Professor Billingsworth during moments of lucidity. "However it really thrives in the unsanitary conditions of the Internet." "Publicist’s balls" has reached epidemic proportions within the pages of tabloid newspapers in between wars and on the websites of political parties at any time of day or night. Despite the ease with which people in the 21st century can get access to information the area thought by many to be the seat of an early outbreak of "publicist’s balls" is still in a highly irritating state. "The condition can be passed easily with word of mouth contact," explained Billingsworth. "Once a new outbreak of "publicist’s balls" occurs near a homeopathic remedy then it can be highly contagious and there is no known cure. You need a witch doctor." Even the rational medical profession has come under attack, with dozens of cases of "publicist’s balls" being identified in the management offices of NHS trusts, government departments and changing rooms of golf-courses up-and-down the land. "Despite the best efforts of the medical profession itself to remain infection free there are localised outbreaks occurring in medical journals," said the professor. "I myself have taken part in many deep cleans. Let me ask you - is milk good or bad for you? Don’t know? You are suffering from "publicist’s balls" too."